Handling time- and temperature-sensitive food/beverage shipments in a highly competitive and regulated environment creates unique challenges for logistics partners and others that support the global cold chain. What are those challenges? How are they being addressed? Where do the opportunities lie? 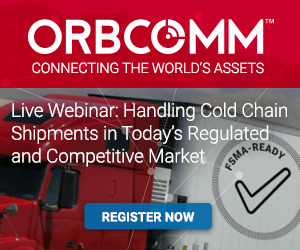 Join Chris Kalinski, ORBCOMM’s VP of Food Safety and Pharmaceutical Solutions, as he and other cold chain experts engage in a candid discussion on these and other issues related to cold chain management.